Yet again it was time for my three-monthly treat: being surprised that it was mathematical puzzle day already! This week it was Hedgehog’s second mathematical Listener, although he has provided a fair few for Magpie. The majority of those been have B and C grade puzzles, although there have been a couple of D graders (tough) thrown in for good measure… hopefully this wasn’t one of them. It’s always interesting when a brand new clueing technique appears, and I certainly hadn’t come across this one before. It looked like fun. A sequence of the letters S, P and N, representing Square, Prime and Neither. The first letter defined what the first digit of the entry was, followed by what the number formed by the first two digits was, then first three, etc? For example, my age would be clued as NN, my date of birth being SN/N/SPNN. It looked as though this might be a relatively straightforward puzzle. An S for the first digit meant that it was 1, 4 or 9; a P meant that it was 2, 3, 5 or 7, and N was 6 or 8. I went through the clues writing each of these groups of digits in the relevant cells. Moving on to numbers formed by the first two digits of each entry: an S meant that the second digit could be 1, 4, 5, 6 , 9 or 0, and a P meant it could be 1, 3, 7 or 9; N could be any digit. Again, I went through the clues in sequence, entering groups of digits in the second cells — in a few cases crossing out digits already there. I applied the same technique to 3-digit, 4-digit and 5-digit groups of esses, pees and ens in turn. What was nice about this puzzle was that you didn’t really need much other than pencil and paper, with a bit of help from the Mathematical Tables on the Listener web site. 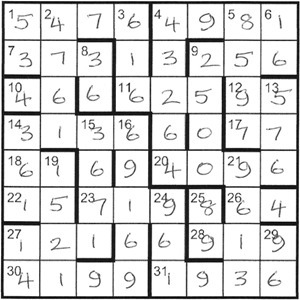 Gradually the grid was full of digits, mostly crossed out, and within an hour the puzzle was complete. That isn’t to say that it wasn’t a nice bit of light relief. In fact, it would have been a gentle introduction to mathematicals for those who generally find them tough. On the Magpie rating, it was probably an A. Thanks anyway, Hedgehog. This entry was posted on 7 March 2014 at 5:00 pm	and is filed under Solving Blogs. You can follow any responses to this entry through the RSS 2.0 feed. You can leave a response, or trackback from your own site.